I have to admit...I'm really getting tired of this pitch blackness at 6am. I know we have a long way to go before that changes but it makes me want to remain curled up under my big comforter and never come out. And the winner is: Joanna! Congrats Joanna! Please email me at theavidappetite@gmail.com and I will get your package out to you first thing on Monday morning. 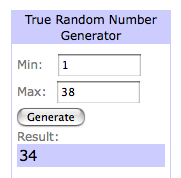 Thank you to everyone who entered! I loved reading about your favorite cookies. It seems like chocolate chip was by far the winner of the bunch, and who could blame you? It's one of my favorites as well...but only when my Aunt Janet makes them because she is famous for her amazing chocolate chip cookies! Meanwhile, I wanted to share the recipe for the cocoa thumbprints in case any of you would like to make them for the holiday! This was the first year that we added them to our repetoire, and I'm so happy that my cousin Veronica picked them out to make on our baking day. They are soft, sugary and have an almost brownie-like texture. I also adore that they are simply beautiful! You can really fill them with whatever you'd like! I think the candied cherries are the prettiest, but sprinkles, mini M&M's, marshmallows, nuts, jam, peanut butter, Nutella or Biscoff spread (yum!) would all work beautifully as well! I can't wait to try some new variations before Christmas. In a mixing bowl, whisk the flour, 3/4 C granulated sugar, cocoa powder, baking powder and salt in a medium bowl. Add the melted butter and eggs, stirring until combined. Cover the dough and refrigerate, about 30 minutes. Preheat the over to 325 degrees. Line 2 baking sheets with parchment paper or a Silpat. Place 1/2 C of the granulated sugar in a small bowl, and the confectioners' sugar in another small bowl. Roll tablespoons of dough into balls, roll in the granulated sugar and then in the confectioners' sugar. Place the dough balls about 1 inch apart on the baking sheets and lightly flatten each ball with your fingers, making a small well in the center of each ball for the filling. Fill the dough with your filling of choice (note: if you are using chocolate chips, jam, pb or Nutella, you should fill the cookies AFTER baking and cooling). Bake the cookies about 10 minutes until slightly cracked. Let them cool for 3 minutes on the baking sheets, then transfer to wire racks. These are definitely going in our permanent collection! 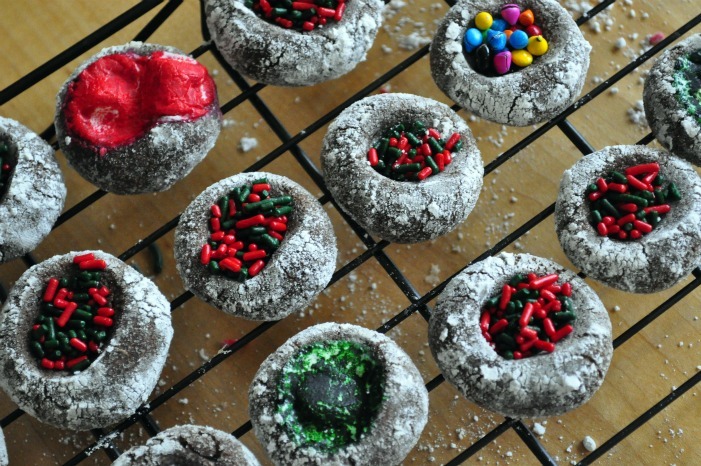 Such a fun change up from the traditional chocolate crinkle, and they would be a gorgeous addition to any cookie tray! Do you wake up in the morning while it's still dark out? What goodies have you made for the season so far? What's still on your list? I still plan to make salted caramels, a white chocolate peppermint cheesecake and perhaps gingerbread cupcakes for this weekend!